You can use the GrapeCity License Manager utility to license ActiveReports Developer during installation or if you already have a trial version installed. This topic gives an overview of all aspects of licensing in ActiveReports Developer. ActiveReports Developer provides three licensing options to choose from. Evaluation No product key is required. All evaluation banners are displayed. There is an initial 30 day time-limit for product use but it can be extended after contacting the sales department. Standard Product key for the standard edition is required. It offers basic report functionality without any evaluation banners. Professional Product key for professional edition is required. All reporting functionality and controls can be accessed with this license without any evaluation banners. See ActiveReports Editions to understand the difference between Standard and Professional Editions. Note: If you have purchased ActiveReports Developer, your product key should have been emailed to you at the time of purchase. If you do not have a product key, you can retrieve it from sales@componentone.com. ActiveReports Developer offers different key types with varying functionality in the way the product works. Trial This key type shows all evaluation banners and the product stops functioning after 30 days from the date of installation. Users can request a new key from the Sales department to grant them an additional 30 days. Standard This key type is given to users who purchase ActiveReports Developer Standard Edition or those who are upgrading from a previous version of ActiveReports Standard Edition. Professional This key type is given to users who purchase ActiveReports Developer Professional Edition or those who are upgrading from a previous version of ActiveReports Professional Edition. From the Start menu, go to the All Programs > ComponentOne > License Manager. In the GrapeCity License Manager window that appears, under Action click Activate. On the Activate [Active Reports 7] screen that appears, click the Next button. User Name: Enter your name here. Organization: Enter your company name here. Email: Enter your e-mail address here. Product Key: Enter the product key exactly as you received it from ComponentOne, including any capital letters. When you enter the product key, a green check mark appears next to this field to indicate a valid key. Click the Next and then the Finish button to complete the licensing process. At the time of installation, on the last screen a check box that states Run license manager appears. Select this checkbox and click the Close button to complete the installation. In the GrapeCity License Manager window that appears, under the Action field, click Activate. Click the Next button to authenticate the license. If your machine does not have an internet connection, select the Use a browser on another machine with Internet connectivity option from the following screen and click the Next button. From the Activate using the GrapeCity web site screen that appears, copy the Product Key and Authentication Number. On another machine with an internet connection, go to https://sas.grapecity.com/activation. Remember to not close the activation dialog on your original machine till the activation process is complete. Enter the Product Key and Authentication Number you copied in step 7 on this website. Click the Send Request button to generate a license key. Copy the license key from the web page that looks like the following image and in the Activate using GrapeCity web site dialog under step 3, enter the key. These steps assume that you already have an ActiveReports Developer licensed edition installed on your system. Open the project in Microsoft Visual Studio. Go to the Visual Studio Build menu and select Rebuild Solution. The executable application is now licensed, and no nag screens or evaluation banners appear when you run it. You can distribute the application to unlicensed machines and no nag screens or evaluation banners appear. Open the Visual Studio Build menu and select Rebuild Solution. Note: For licensing Web Site applications, open the Visual Studio Build menu and select Build Runtime Licenses to create the App_Licenses.dll file. The web application is now licensed, no evaluation banners appear when you run it. You can distribute the Web application to unlicensed machines and no evaluation banners appear. In the GrapeCity License Manager window that appears, under Upgrade/Downgrade click Upgrade to Professional License. Follow the activation steps from step 3 of To license an ActiveReports Developer Trial without reinstalling to upgrade. In the GrapeCity License Manager window that appears, under Upgrade/Downgrade click Downgrade to Standard License. In the Deactivate the Product Key screen that appears select the Next button. Confirm the Product screen appears. Confirm that the correct product is getting downgraded and click the Next button. Deactivation Successful screen appears with the Product Name as Active Reports 7 and the Current Status as Standard License. with the actual ActiveReports Developer version. Note: When using the PDF export filter in your project, make sure you check the licenses.licx file for reference to the PDF Export Assembly. For your medium trust and Windows Azure projects with ActiveReports Developer, you may need to generate a Web Key by using the Web Key Generator utility on a machine with licensed ActiveReports Developer. From the Start Menu, go to All Programs > ComponentOne > ActiveReports Developer > Generate WebKey and run the Web Key Generator utility. 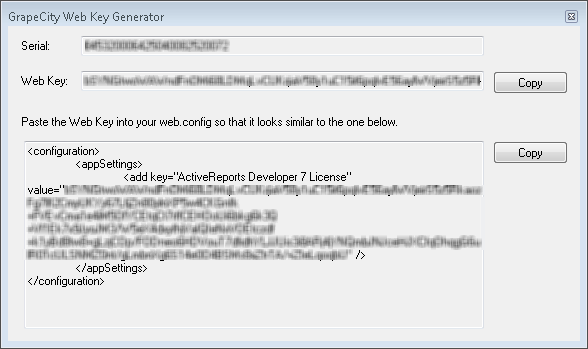 Note: You can find the WebKeyGenerator.exe in the ....\Common files\ComponentOne\ActiveReports Developer 7 folder. In the dialog that appears, copy the Web Key by clicking Copy. We recommend that you use the second Copy button to copy the Web Key together with the corresponding web.config section. Paste the Web Key into the web.config file of your project between the opening and closing <configuration> tags to remove the licensing message. The web.config key looks like the following. Note: If you see the message "Your computer is not currently licensed" in the Web Key Generator dialog, please license your machine. You can license your ActiveReports Developer class library project using the Application License Generator utility. Ensure that ActiveReports Developer is licensed on the machine by following the steps above in the "To license ActiveReports Developer on a machine during installation" or "To license an ActiveReports Developer trial without reinstallation" sections. Run the ApplicationLicenseGenerator.exe from the ...\Common Files\ComponentOne\ActiveReports Developer 7 folder. Click the Browse button and select the compiled dll that requires licensing. Distribute the generated file <AssemblyName>.GrapeCity.Licenses.dll along with the application. If your license key is invalid or corrupt, you may get an invalid license message. Run the setup to re-install and authenticate the license. Open the GrapeCity License Manager utility by clicking Run the License Manger (activate/deactivate) link in this error message and click Activate. Follow the licensing steps from To license an ActiveReports Developer Trial without reinstalling to license your product and remove the error message. You can deactivate your ActiveReports Developer license and go back to a Trial License. In the GrapeCity License Manager window that appears, under Action click Deactivate. In the Deactivate [Active Reports 7] screen that appears select the Next button. Deactivation Successful screen appears with the Product Name as Active Reports 7 and the Current Status as Trial License (number of days left). ©2014. ComponentOne, a division of GrapeCity. All rights reserved.